We provide pediatric foot care to children of all ages. It is common to have foot conditions at a young age, but it is never normal. In some cases foot pain is genetic, while in other cases, it is developed or acquired. Regardless of how the condition occured, if you notice something unusual about the way your child walks, stands or how their feet or ankles are developing, you should make an appointment at Next Step Foot and Ankle Clinic with our pediatric foot specialist. If you have an active kid, you are probably used to fielding an array of bumps, bruises, and minor injuries. What many parents are not used to dealing with, however, are complaints of chronic pain from their children. Many people assume that chronic pain and foot problems are unique to older people or experienced athletes, so they assume that their children will eventually outgrow their symptoms. While many of their aches and pains may, indeed, be related to growing pains, the symptoms may not disappear—they could get worse. Podiatry is not a practice reserved for adults, and Next Step Foot & Ankle Clinic has successfully helped children of all ages overcome their chronic pain and injuries to return to their pain-free and active lives. Sever’s Disease and Heel Pain: One of the most common childhood complaints, heel pain is often caused by Sever’s disease. Sever’s disease is the result of the growth plates in the heel growing faster than the Achilles tendon, which causes irritation and pain as the tendon and other muscles tighten. Dr. Silvester can help treat symptoms effectively and economically with shoe inserts and therapy. Flat Feet: Flat feet can often be a hereditary problem that causes lifeline knee, hip, and back pain. While many parents wait to see if the child will outgrow the problem, after the age of seven it is unlikely that the condition will improve. For serious cases, simple, minimally invasive surgery can help your child’s feet grow and develop in the proper alignment, which can offer pain-free support for a lifetime. Plantar Warts: Children often experience problems with plantar warts, which can cause intense pain when they spring up on the ball of the foot or heel. With simple procedures that can be performed in the office with minimal pain over the course of a few weeks, your child can overcome their painful warts. Sprains and Sports Injuries: Many kids start sports at a young age, and this can often lead to injuries. Sprains are some of the most common sports injuries a child can suffer, and if not treated promptly, can lead to long-term problems. If your child has suffered an ankle sprain, let the Next Step Foot & Ankle Clinic help him get back on his feet! 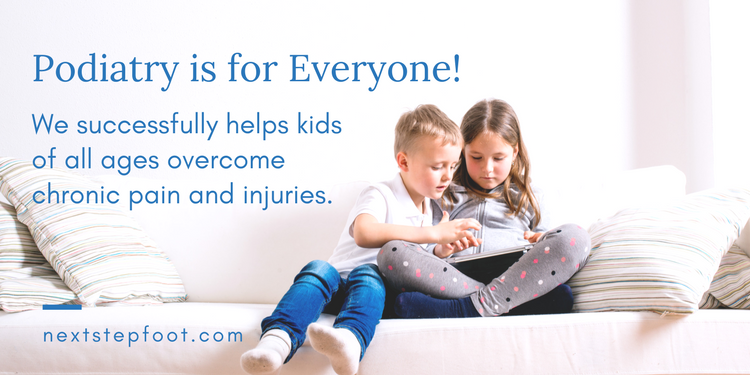 Fractures and Overuse Injuries: Fractures can either be the result of a direct trauma or overuse, and these can leave a child in serious pain. Next Step can help your child’s fracture heal and provide important follow-up therapy to ensure a total recovery. Chronic pain is never something that your child should expect to live with. If you have noticed that your child is experiencing pain and tenderness—or, if they have suffered a foot or ankle injury—come see the Next Step team to see what we can do to help your child get back to being a kid! Schedule an appointment with Dr Bills or Dr. Silvester today by using our online scheduling tool, or by calling us at 830-569-3338, 210-375-3318 or 855-972-9512.